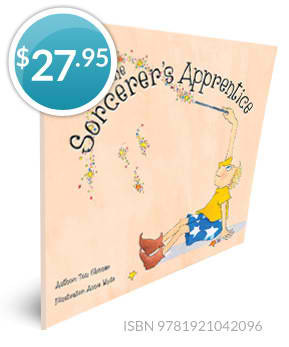 The Sorcerer's Apprentice, [Book+CD] is a modern take on the Disney classic from Fantasia. It aims to inspire kids to appreciate both the music and stories behind famous pieces of classical music. 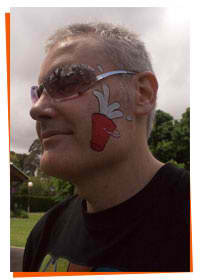 A Fun, Funny, Crisp Foot Tapping Intro To Classical Music For Kids Aged 5-10. It's A Picture Book Plus Audio CD Read by Antonia Kidman. Rizwan is a bright, impetuous young lad who is very anxious to learn the magic business from his Sorcerer boss. Things go rapidly pear-shaped when Rizwan starts practicing some of the boss's best magic tricks before learning how to control them. The Sorcerer's Apprentice is a rewrite of the 1797 German poem Der Zauberlehrling. Frenchman Paul Dukas, composed the music to Der Zauberlehrling in 1897, "L'Apprenti sorcier". The story, which comes with a bonus music CD, unfolds to this well-loved composition which was popularized by Walt Disney in the acclaimed 1940 film, Fantasia. Mickey Mouse played the apprentice. Everyone's favourite Disney movie, Fantasia, and it's famous musical composition, The Sorcerer's Apprentice, gets a modern twist by South Australian author Tom Skinner, renowned illustrator, Annie White and celebrity, Antonia Kidman. Mickey Mouse is now Rizwan the camel cleaner! The Sorcerer's laboratory is now a car and camel wash! The Sorcerers Apprentice is a cheerful tale with lively illustrations that match Dukas' colourful palette of sounds. A great way to introduce this entertaining orchestral masterpiece to children.